The Divje Babe Flute is a cave bear femur pierced by spaced holes that was found in 1995 at the Divje Babe archeological park located near Cerkno in northwestern Slovenia. It has been suggested that it was made by Neanderthals as a form of musical instrument, its hole spacing and alignment leading to its being labeled a 'Neanderthal flute'. 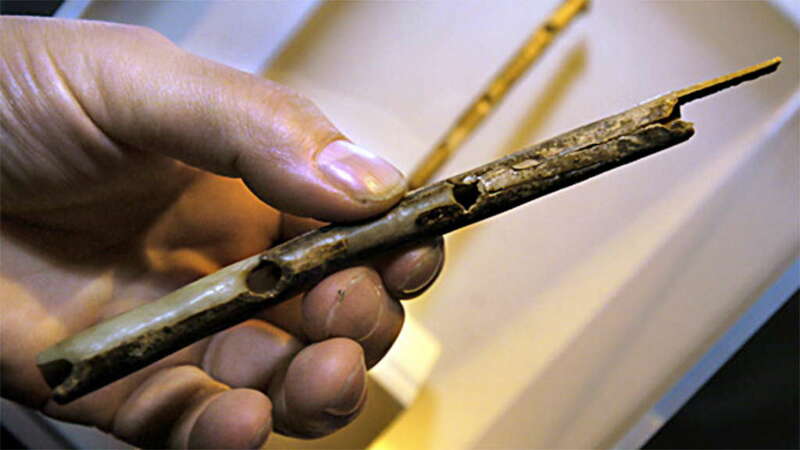 A form of flute, it is possibly the world's oldest known musical instrument. 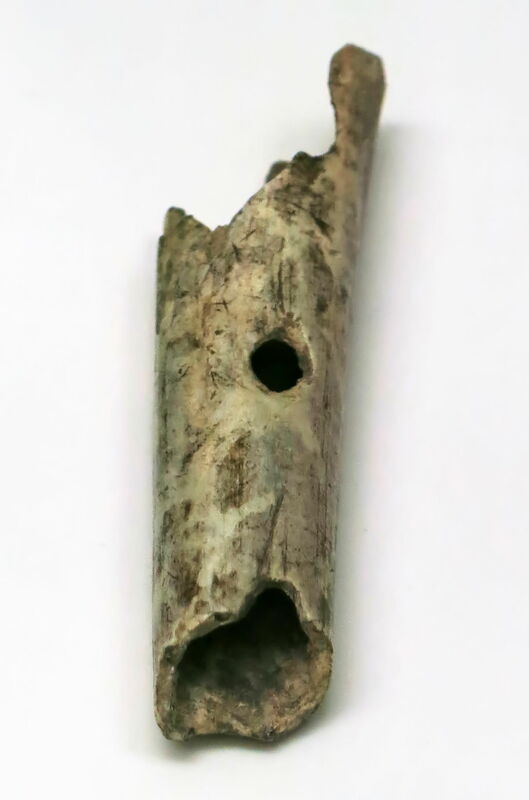 According to Electron spin resonance (ESR) dating of the layer containing the flute it is between 50 to 60 ky old.The artefact remains on prominent public display in the National Museum of Slovenia in Ljubljana as a Neanderthal flute. In 1995, Ivan Turk found the cave bear femur at the Divje Babe site near a Mousterian hearth. Because it has the characteristics of a flute he has dubbed it a Neanderthal flute. It is broken at both ends, and has two complete holes and what may be the incomplete remains of one hole on each end, meaning that the bone may have had four or more holes before being damaged. The bone fragment is the diaphysis of the left femur of a one to two year old cave bear and is 133.6 mm (5.26 in) long. The maximum diameter of the two complete holes is 9.7 mm (0.38 in) and 9.0 mm (0.35 in). The distance between the centres of the holes is 35 mm (1.38 in). The view of the steep northern slope of the Šebrelje plateau with the entrance to the Divje babe I cave (in circle) where the flute was found, and a location map. The longitudinal profile of Divje babe I. The Mousterian musical instrument was found at 1 m distance of this profile firmly cemented into phosphate breccia (Layer 8a) in the immediate vicinity of hearth (after Turk et al. (2007)). b: The reconstructed musical instrument: holes (1–3, 5), the notch (4), the mouthpiece with sharp blowing edge (marked with an arrow), and the opening (6) in the function of bell or closure. Based on numerous multidisciplinary scientific experiments and analyses, the finders of the perforated bone and their co-workers proposed many strong arguments in support of the artificial origin of the holes It was attested experimentally that no carnivore could have made four holes on the rigid diaphysis. Multiple piercing of bone (even if we consider only the complete Holes 2 and 3) with missing epiphyses would split the bone longitudinally. Holes exactly aligned on the middle of the longitudinal axis of the diaphysis could not be reasonably explained by carnivore action. Furthermore, thorough CT investigations revealed no reliable counterbite marks corresponding to an antagonist tooth when piercing both complete holes, and seriously called into a question the origin of some features previously declared solely as of carnivore origin. 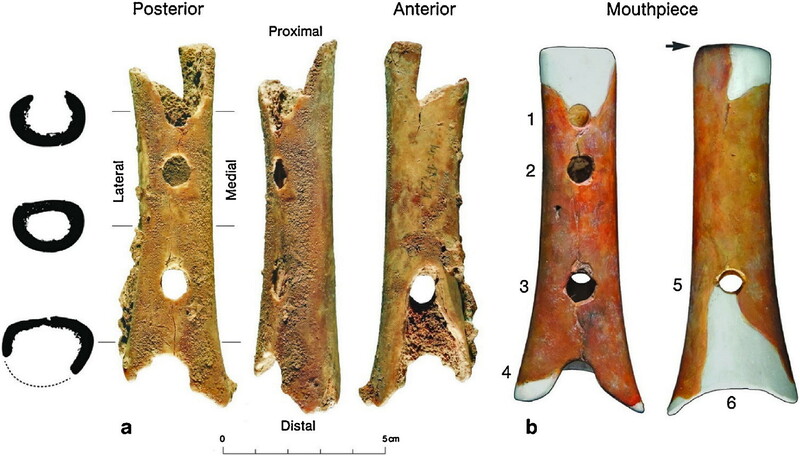 • The Neanderthal chose a juvenile cave bear femur with both metaphyses (and probably an attached infused epiphyses) or a femur that lacked the distal epiphysis and that may already have had Notch 4 and possibly Hole 5, thanks to carnivore gnawing. • A Neanderthal deliberately made three holes on the posterior side in a straight line. By scraping or polishing, he thinned the cortical bone in the area of at least Hole 3 to facilitate piercing. By doing so, two parallel short cuts were left on the abraded cortical bone above Hole 3. • Using a denticulate stone tool (Fig. 6), the Neanderthal made an incision around the proximal part of diaphysis and broke off the metaphysis. By bevelling the outer and inner sides of a straight broken edge on the wider medial part, a sharp blowing edge of the mouthpiece was created. • If the distal metaphysis had not previously been notched, the Neanderthal now made it so. • When the instrument had been abandoned, most probably gnawing by a wolf caused V-shaped fractures on the mouthpiece and on distal end. The two V-shaped fractures, which end in the two partial holes (i.e., Holes 1 and 5), could not have been made simultaneously with these holes, but after them upon the new pressure on the weakened perforated cortical bone. Similar action could be observed in the Grubgraben Gravettian flute. Bite marks prove carnivore gnawing on both ends but they have no reliable connection to the production of both complete Holes 2 and 3. • In its design, construction, and capability, the Mousterian musical instrument from DB differs significantly from Early Upper Palaeolithic wind instruments. An artificially modified sharp blowing edge on the mouthpiece is unique feature among known Palaeolithic wind instruments. Its advanced musical capability suggests that the instrument was not used by hunters for attracting prey or for signalling but was rather used for playing music for ritual or other purposes (Dimkaroski, 2014). Whistles made of Reindeer Bones, Petersfels, ca 15 000 BP. Whistle from Roc de Marcamps, probably from the bone of a bird. 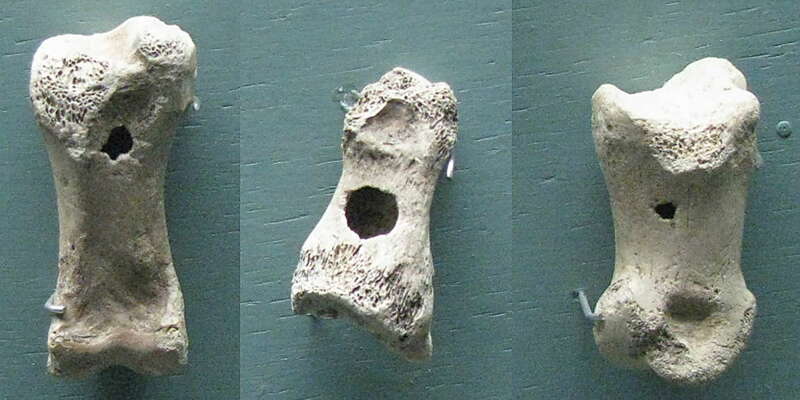 Magdalenian whistles from Roc de Marcamps, made of bird bones. Gravettian whistle from l'abri Lespaux, Saint-Quentin-de-Baron, made from a bird bone. Magdalenian 'bullroarer', covered with red ochre and incised with linear motifs, from La Roche, Lalinde, Dordogne. 180 mm long, 40 mm wide at widest point. 1. Magdalenian; La Roche, Lalinde, Dordogne, see above. Length 180mm. 2. Magdalenian; Abri de Laugerie Basse, Les Eyzies-de-Tayac. Length 107mm. 3. Solutrean; Lespugue, Haute Garonne. Length 90mm. 4. Solutrean; Badegoule, Dordogne. Length 190mm. Music and dance are ephemeral art forms. 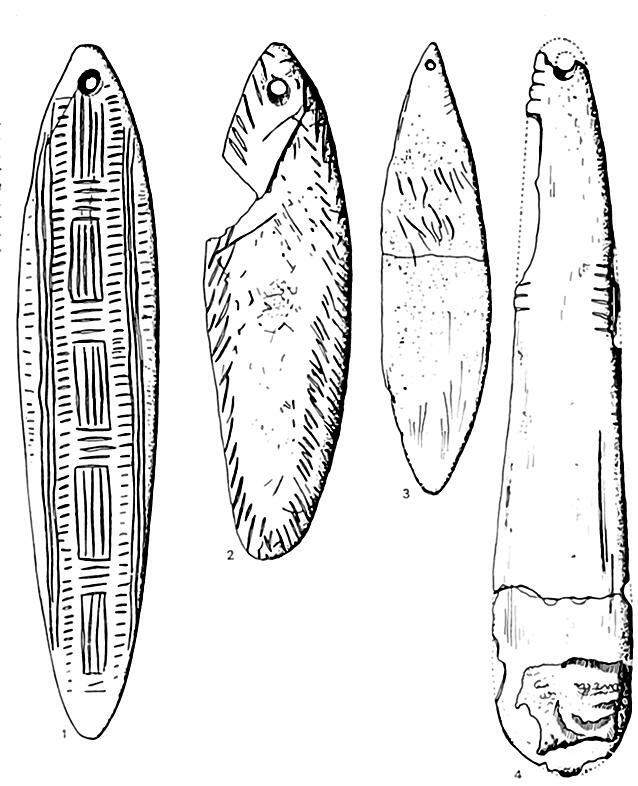 However the existence of music in the Paleolithic is attested by the discovery of several types of instruments: flutes, whistles, bull-roarers and scrapers. Drums probably existed in the Paleolithic, but these instruments made of wood and skin are rarely if ever preserved. However, in some caves, calcite sheets or curtains showing traces of percussion testify to the rhythmical talents of prehistoric musicians. 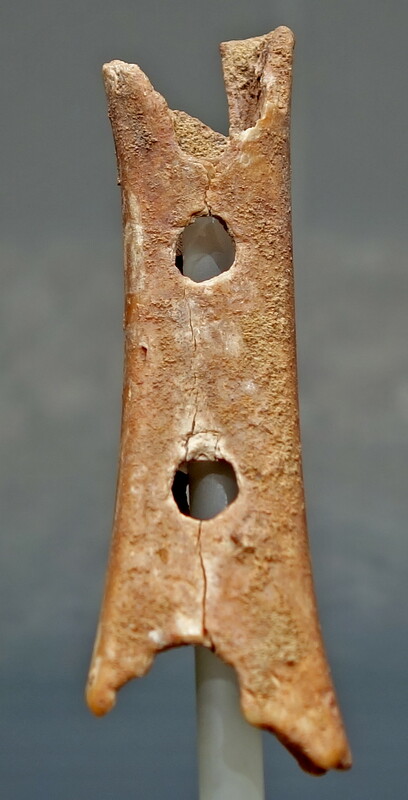 60: Bone flute, facsimile, from Isturitz, Atlantic Pyrenees. 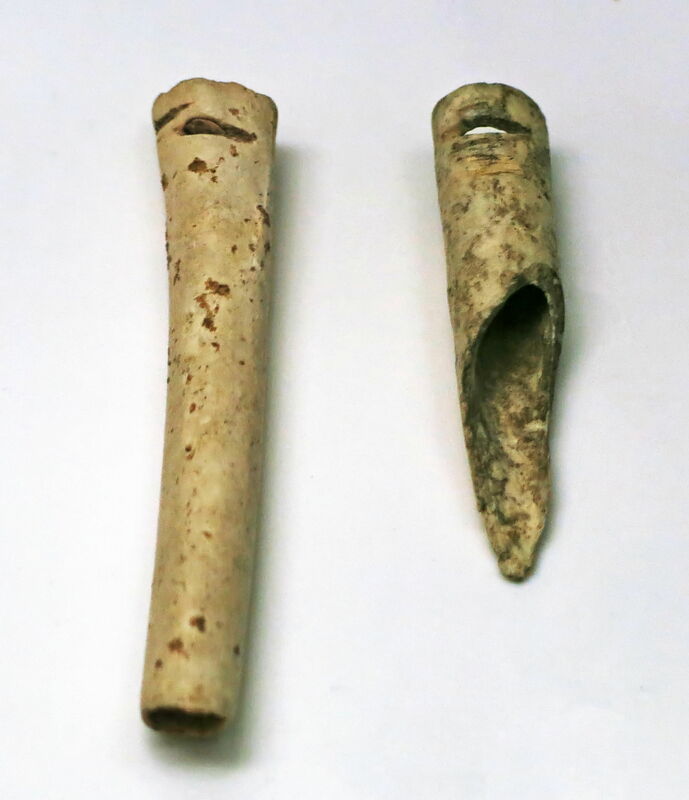 61: Whistle in bone, original, from Laugerie-Basse, Dordogne. 62: Bullroarer or rhombus or turndun, facsimile, in reindeer antler, Lalinde, Dordogne. Note the colour, originally from ochre, and the regular straight lines and rectangles decorating it. 63: Scraper, or scraped idiophone, original, from Mas d'Azil, Ariège. This one seems to have been made from a salvaged broken spear straightener. Scraped idiophones (an idiophone is defined as a musical instrument from which the sound comes from the natural sonorous quality of the instrument itself, not from a stretched string or hide or enclosed column of air) are rasps or notched sticks over which another stick is scraped, resulting in a series of beats. Closeups of the idiophone from Mas d'Azil above. Thousands of years after they first resonated in caves, two dozen stone chimes used by our prehistoric forefathers will make music once more in a unique series of concerts in Paris. Known as lithophones, the instruments have been dusted off from museum storage to be played in public for the first time to give modern Man an idea of his ancestral sounds. Dubbed 'Paleomusique', the piece was written by classical composer Philippe Fenelon to showcase the mineral clang and echo of instruments from beyond recorded time. They will be played xylophone-style by four percussionists from the French National Orchestra gently tapping the stones with mallets. The point is to highlight our ancestors' musical side, which Gonthier says is often overshadowed by their rock-painting and tool-making prowess. In fact, he believes, there might have been a strong link between music and visual art in prehistoric caves. Another view of the lithophone. 'These were the first theatre or cinema halls,' he speculated. 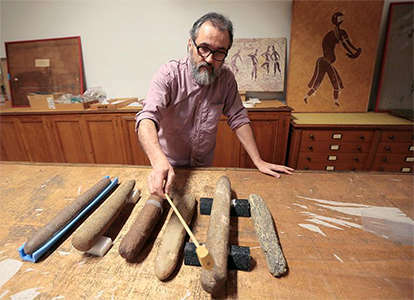 The instruments, carefully-crafted stone rods up to a metre (3.2 feet) in length, have been in the museum's collection since the early 20th century. They have been dated to between 4 500 and 10 000 BP, a period known as the New Stone Age, characterised by human use of stone tools, pottery-making, the rise of farming and animal domestication. For decades, their solid, oblong shape made experts believe they were pestles or grinders of grain. But that perception changed a decade ago, thanks to a stroke of fortune. Gonthier, a former jeweller and stone-cutter, discovered their true, musical nature when he tapped one with a mallet in the storeroom of the museum in 1994. Instead of a dull thud he heard musical potential, and decided to investigate further. 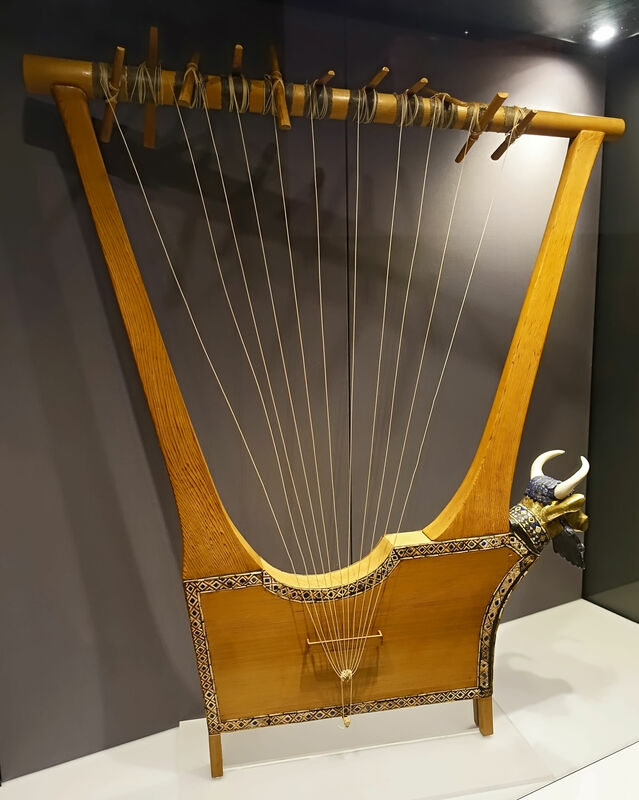 Gonthier named his first lithophone 'Stradivarius' after the famous makers of string instruments. The instrument was the result of a "grain-by-grain" chipping process that could have taken as much as two years to complete. Five years after his discovery, 'Stradivarius' and dozens of other stones in the museum's collection were officially recognised as lithophones, a known if obscure category of musical instruments. The name derives from the Greek words for stone and sound. Gonthier said he had a long battle to convince other experts the stones could be safely used, with great care, for the upcoming concert. The museum's lithophones are mainly from the Sahara, many brought back by French troops stationed in colonies like Algeria and Sudan in the early 1900s. Gonthier says all lithophones, which can be made from types of sandstone or schist, share certain characteristics. Each one always comes to rest in the same position determined by its centre of gravity, and every instrument has two sound 'planes' that can be found by tapping at 90 degree angles around its circumference. Importantly, the instruments are short and slim enough to be carried easily in one hand -- the earliest example of a portable sound system. For years, these cylindrical stones lay forgotten, dusty in the basements of a museum, until the French ethno-Mineralogist Eric Gonthier identified them as musical instruments from the Neolithic period. Now the sound of the stones may be heard for the first time in thousands of years. The French National Orchestra's 80th Birthday Celebrations were given a composition with the 'Lithophonen' - a world premiere. Clicking the link above a couple of times should take you to the youtube site to watch the video. If this does not happen, or if the video has disappeared from youtube, please let me know. A 30 000 year old instrument is uncovered in southern Germany. One of the world's oldest known musical instruments has been discovered by German archaeologists. The 18.7-centimetre-long flute, which is carved from mammoth ivory, has three finger holes and would have been capable of playing relatively complex melodies. The flute was found in 31 pieces in the Geißenklösterle cave in mountains near Ulm in southern Germany. Two other flutes made of swan bones were discovered at the site more than a decade ago. The three are much older than any other musical instrument yet discovered. Nicholas Conard from the University of Tübingen, Germany, and his colleagues report the find in the latest edition of the Archäologisches Korrespondenzblatt. They dated the age of the deposits where the three flutes were found to between 30 000 and 37 000 years old. But it is the extraordinary sophistication of the newly discovered instrument that sets it apart from the swan-bone flutes. "This third flute is like a Rolls Royce compared with a Hyundai," says Conard. Its makers used mammoth ivory, the highest quality material available to them at the time, he says. Carving a flute from solid ivory is much more demanding than making a flute from bird bones, which are already hollow. The crooked mammoth tusk had to be split and the two halves carefully hollowed out, then bound and glued together along a perfectly airtight seam. The 30 000-year-old instrument could have played relatively sophisticated tunes. Click here to hear a music sample. The inhabitants of the region were adept artisans, and small ivory figurines, which are among the earliest known examples of figurative art, have been found in several sites. 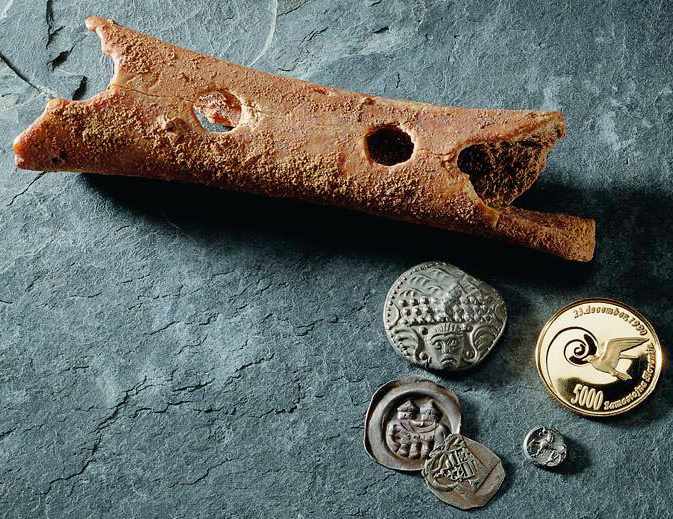 Southern Germany "may have been one of the places where human culture originated", says Conard. 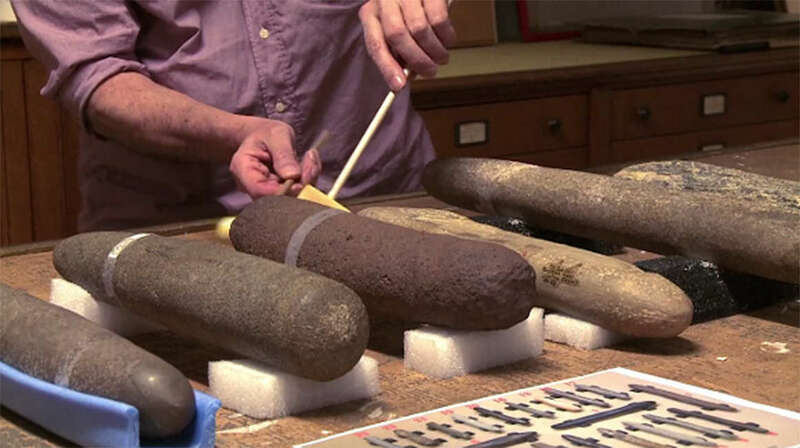 A few fragments of the Stone Age flute are missing, but to investigate what kind of music the instrument would have made, Friedrich Seeberger, an expert in prehistoric music and co-author of this report, has made a replica in elder wood. His early experimentation suggests that the old flute would have allowed a relatively sophisticated level of musical variation. "The tones are quite harmonic," he says. They don't seem to follow a diatonic scale, he notes, but rather the rules of the pentatonic scale that predominates in Asia. Seeberger now plans to build a more accurate replica, to hear exactly what the original flute would have sounded like. He is currently seeking the right material: mammoth ivory, of course. 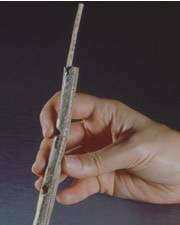 Composed of 31 fragments, this flute made of mammoth ivory is from the Geißenklösterle cave near Blaubeuren. It was carved 30-37 000 years ago, and with it relatively complex melodies could be played. 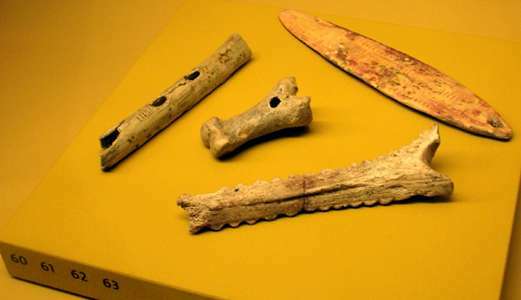 Archaeologists also found in Geißenklösterle two palaeolithic flutes that were made from swan bones. In the Divje babe I cave in the Idrijca river valley at Šebrelje, the Institute of Archaeology of the Scientific Research Centre at the Slovene Academy of Sciences and Arts has been exploring several geological layers, rich with evidence of human presence, which have so far yielded a large quantity of archaeological finds ranging from the bones of different animal species (belonging mostly to the cave bear) to tools made of stone and bone which were produced and used by Neanderthals in the mid-Palaeolithic period, followed by Cro-Magnon man, the oldest modern thinking human in Europe, in the late-Palaeolithic period. Excellent results and discoveries made during these excavations have turned the cave into one of the most important Stone Age archaeological sites in the world. Previously the most famous such Slovene site had been Potočka Zijalka at Olševa. 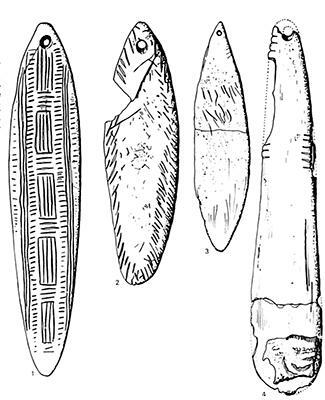 But in 1995 an extraordinary find was discovered in Divje babe - a bone flute. The flute was unearthed in the 45 000 year old remains of a Neanderthal fireplace. It is made from a piece of hollow cave bear cub bone and contains drilled holes, the arrangement of which corresponds to the distances between the fingers. This is a reconstruction, the wooden parts, pegs and string are modern. The harp has Lapis lazuli, shell and red limestone mosaic decoration, set in bitumen and the head (but not the horns) of the bull are ancient. 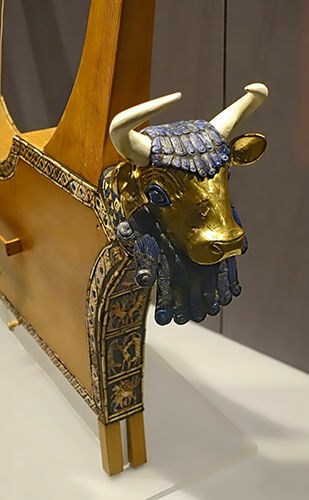 The bull's head in front of the sound box is covered with gold. The eyes are lapis lazuli and shell and the hair and beard are lapis lazuli. The significance of the beard is not known. A panel on the front depicts a lion-headed eagle between gazelles, bulls with plants on hills, a bull-man between leopards and a lion attacking a bull. The edges of the sound-box are decorated with inlay bands. There are eleven gold-headed pegs for the strings. Leonard Woolley discovered several lyres in the graves in the Royal Cemetery at Ur. This was one of two that he found in the grave of 'Queen' Pu-abi. Along with the lyre, which stood against the pit wall, were the bodies of ten women with fine jewellery, presumed to be sacrificial victims, and numerous stone and metal vessels. One woman lay right against the lyre and, according to Woolley, the bones of her hands were placed where the strings would have been. The wooden parts of the lyre had decayed in the soil, but Woolley poured plaster of Paris into the depression left by the vanished wood and so preserved the decoration in place. The front panels are made of lapis lazuli, shell and red limestone originally set in bitumen. The gold mask of the bull decorating the front of the sounding box had been crushed and had to be restored. 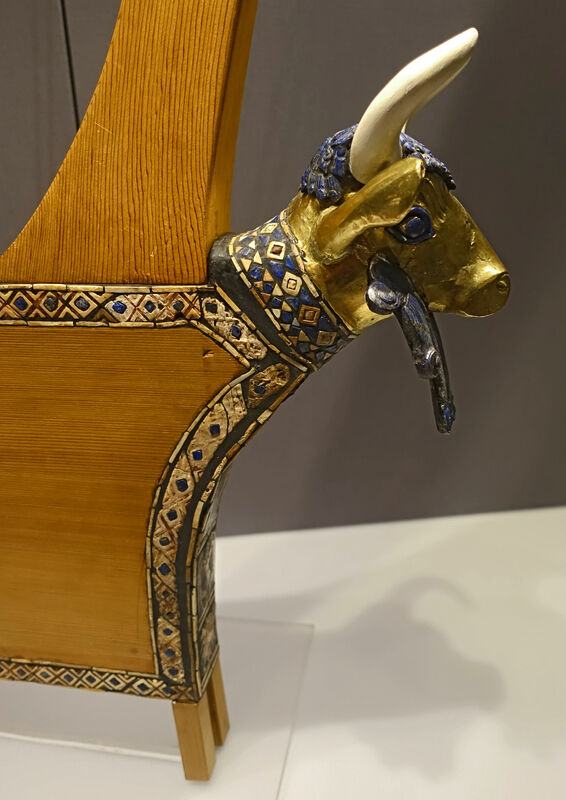 While the horns are modern, the beard, hair and eyes are original and made of lapis lazuli. 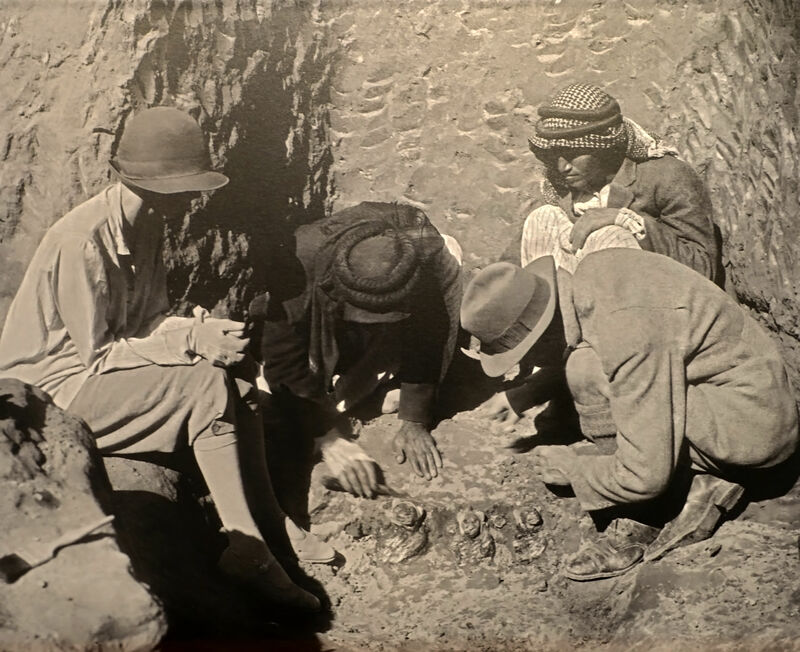 The photo shows Leonard Woolley (right) excavating at Ur, 1928. When the archaeologist Leonard Woolley excavated at Ur during the 1920s, he discovered several lyres in graves within the 'Royal Cemetery'. This is one of two from the grave of Queen Puabi. Along with the lyres, Woolley found the bodies of ten women wearing elaborate jewellery, presumed to be the queen's servants. He described how one woman lay right against this lyre with the bones of her hands where the strings would have been. By the time this lyre was discovered, the wooden parts of the instrument had decayed. Woolley managed to recreate the original by pouring plaster into the depression left by the wood. The gold mask of the bull decorating the front of the sound box was crushed and has been restored. The horns are modern, but the beard, hair and eyes are original. The world's first cities were established about 5 000 years ago, when settlements of between 30 000 and 40 000 people emerged in Mesopotamia (modern Iraq). The most famous of these is the Sumerian city of Ur, where this lyre was discovered in a royal grave. The scenes on the front of the lyre show a lion-headed eagle between gazelles, bulls and plants, a bull-man between leopards and a lion attacking a bull. The materials used to make this lyre reveal the extent of Ur's trade routes and connections. The lapis lazuli probably comes from Afghanistan, the gold from Iran or Egypt, and the shells from the Persian Gulf. These luxury materials reveal that Ur was a wealthy city with the resources and social organisation required for successful trade. Bahn P., 1997: Journey Through the Ice Age, Weidenfeld and Nicholson, London. Dauvois M., 1989: Son et Musique Paléolithiques, Les Dossiers D'Archéologie, Vol. 142, p. 2-11. Dimkaroski L., 2014: Musical research into the flute. From suspected to contemporary musical instrument. in: Turk, I. (Ed.) Divje babe I. Upper Pleistocene Palaeolithic site in Slovenia. Part 2: Archaeology, Opera Instituti Archaeologici Sloveniae, 29, ZRC Publishing, Ljubljana, pp. 215–222. Turk, I., Skaberne, D., Orel, B., Turk, J., Kranjc, A., Slemenik-Persˇe, L., Meden, A., 2007. Sediments at the Divje babe I site. In: Turk, I. (Ed. ), Divje babe I: Upper Pleistocene Palaeolithic Site in Slovenia, Part 1: Geology and Palaeontology. Opera Instituti Archaeologici Sloveniae 13, ZRC Publishing, Ljubljana, pp. 105–121. Turk M., Turk I., Dimkaroski L., Blackwell B., Horusitzky F., Otte M., Batiani G., Korat L., 2018: The Mousterian Musical Instrument from the Divje babe I cave (Slovenia): Arguments on the Material Evidence for Neanderthal Musical Behaviour, Opera Instituti Archaeologici Sloveniae, 13, ZRC Publishing, Ljubljana, pp. 105–121.